Marshal Pietro Badoglio, 1st Duke of Addis Abeba, 1st Marquess of Sabotino, was an Italian general during both World Wars and the first viceroy of Italian East Africa. 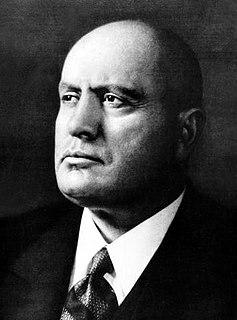 With the Fall of the Fascist regime in Italy, he became Prime Minister of Italy. The 15th Army Group was an Army Group consisted by the British Eighth and the U.S. Fifth Armies, which apart from troops from the British Empire and U.S.A., also had whole units from other allied countries/regions; like 2 of their Corps, 1 Division and 7 Brigades, besides supporting and being supported by the local Italian partisans. It operated in the Italian Campaign during the WWII, between 1943-45. Lecce is a historic city of 95,766 inhabitants (2015) in southern Italy, the capital of the province of Lecce, the second province in the region by population, as well as one of the most important cities of Apulia. It is the main city of the Salentine Peninsula, a sub-peninsula at the heel of the Italian Peninsula and is over 2,000 years old. "Italian military internees" was the official name given by Germany to the Italian soldiers captured, rounded up and deported in the territories of Nazi Germany in Operation Achse in the days immediately following the World War II armistice between Italy and Allied armed forces. A corps (1° Raggruppamento Motorizzato) was then created. The unit included elements of two divisions that had previously been part of the Regio Esercito: the 18 Infantry Division Messina and the 58 Infantry Division Legnano  The corps was composed of 295 officers and 5,387 men. 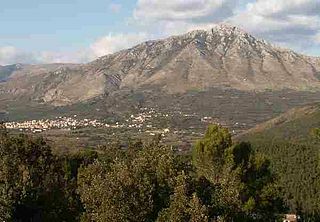 The Battle of San Pietro Infine was a major engagement from 8–17 December 1943, in the Italian Campaign of World War II involving Allied forces attacking from the south against heavily fortified positions of the German "Winter Line" in and around the town of San Pietro Infine, just south of Monte Cassino about halfway between Naples and Rome. The Alpini, are a specialised mountain warfare infantry corps of the Italian Army. They are currently organized in two operational brigades, which are subordinated to the Alpine Troops Headquarters. This article is about the Italian Royal Army which participated in World War II. The Paratroopers Brigade "Folgore" is an airborne brigade of the Italian Army. Its core units are three battalions of paratroopers (paracadutisti). The name Folgore is Italian for lightning. The Folgore is one of three light infantry brigades of the Italian Army. While the Folgore specializes in parachute operations its sister brigade in the Friuli Division the Airmobile Brigade Friuli specializes in helicopter assault operations. The Folgore and its units are based in Tuscany, Veneto and Lazio. The Paracadutisti are the paratroops of Italy. On March 1, 1984 the Italian Institute for Disarmament, Development and Peace (Istituto di ricerche per il disarmo, lo sviluppo e la pace in Rome published the entire Italian Army order of battle down to company level - this was justified for the radical party as one of its core demands was total disarmament of Europe, even though the data which was published was top secret. The Radical Party dissolved in 1989 and the IRDISP followed suit in 1990. But Radio Radicale has survived, and the OrBat can still be found today on the homepage of the radio. The Aosta Mechanized Brigade is a mechanized infantry brigade of the Italian Army, based on the island of Sicily. The Brigade is one of the oldest of the Italian Army and the name connects the brigade to its original area of recruitment the Aosta Valley and its coat of arms is modeled after Aosta's coat of arms. 185th Paratroopers Division Folgore or 185ª Divisione Paracadutisti Folgore was a Parachute Division of the Italian Army during World War II. The 104th Infantry Division Mantova was a auto-transportable Infantry Division of the Italian Army during the Second World War.. The 54th Infantry Division Napoli was a regular infantry division of the Italian Army during World War II. It was created 15 April 1939 in Caltanissetta and was dissolved 14 August 1943 in Melia southeast of Scilla, Calabria after being nearly wiped out in the Allied invasion of Sicily. The division drafted men in southern Sicily. The members of the division hailed from Caltanissetta, Agrigento, Syracuse and surrounding territories. Operation Grapeshot order of battle is a listing of the significant formations that were involved in the Spring 1945 offensive in the Apennine Mountains and the Po valley in northern Italy, April 1945 – May 1945. The Legnano Mechanized Brigade was a mechanized brigade of the Italian Army. Its core units were mechanized Infantry battalions. The brigade's headquarters was in the city of Bergamo in Lombardy. The name of the brigade commemorates the Lombard League victory in the Battle of Legnano in 1176 and its coat of arms depicts the Monument to the Warrior of Legnano in the centre of Legnano. The Cremona Motorized Brigade was an infantry brigade of the Italian Army. The brigade's headquarters was in the city of Turin. The brigade carried on the name and traditions of the 44th Infantry Division Cremona. 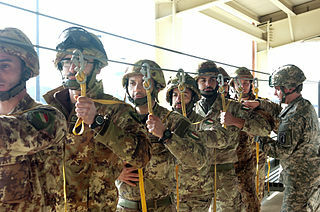 The 8th Paratroopers Engineers Regiment "Folgore" is the unique and special unit manned by para combat engineers belonging to the Italian Army which exists to provide close combat support to the Paratroopers Brigade Folgore. For this reason it is fully manned, able to deploy with a very short notice and fighting in every environment, either permissive and nonpermissive one. In peacetime it is continuously involved in supporting civil population disposing explosive remnants of war or other explosive devices, normally in support of police forces, and in case of natural disaster. ↑ "Order of Battle: Italian Co-Belligerent Forces". Military History Network. 11 March 2004. Retrieved 2007-12-21. ↑ Fatutta, Francesco: "L'Esercito nella Guerra di Liberazione (1943-1945)", Rivista Italiana Difesa, n°8 Agosto 2002, pag. 82-94.